This Warm Bacon Cheese Dip is the perfect holiday appetizer or snack for any occasion. It is so easy to make, and takes minutes to throw together. People are constantly raving about this dish, and I'm sure you'll know why once you try it. This post is sponsored by Wright Bacon but all opinions are honest and are my own. Thank you for letting us share with you brands we love. When it comes to making this recipe, high-quality bacon will make all the difference. We love using Wright Brand because they have been making premium quality, hearty, thick-cut bacon the right way for generations- just like many of our favorite recipes have been passed down for generations. Wright Brand bacon is available in five varieties, including Barrel Aged Bourbon Bacon, Naturally Smoked Brown Sugar Flavored Bacon, Naturally Hickory Smoked Bacon, Naturally Applewood Smoked Bacon and Naturally Smoked Maple Flavored Bacon. Be sure to visit WrightBrand.com to learn more about Wright Brand bacon, varieties and availability. Do you have a favorite bacon-inspired holiday recipe? We would love to have you share it with us in the comments below. When it comes to holiday parties, the most important part for our family is the food. There are certain dishes that always show up for each holiday: Chinese food on Christmas Eve, Grandma’s ham on Easter, Mom’s chili on Halloween, and lots and lots of appetizers on New Year’s Eve. When the sisters and our families get together, we all bring appetizers that we can snack on all night long as we watch movies and countdown to the new year. This year, I am bringing this Bacon Cheese Dip- it’s loaded with thick bacon, gooey cheese, and baked to perfection. Preheat oven to 350 degrees. Spray an 8x8" baking pan with non-stick cooking spray. Cook 8 strips of bacon to desired crispiness. Crumble 6 strips of bacon and set aside the other two strips for later. 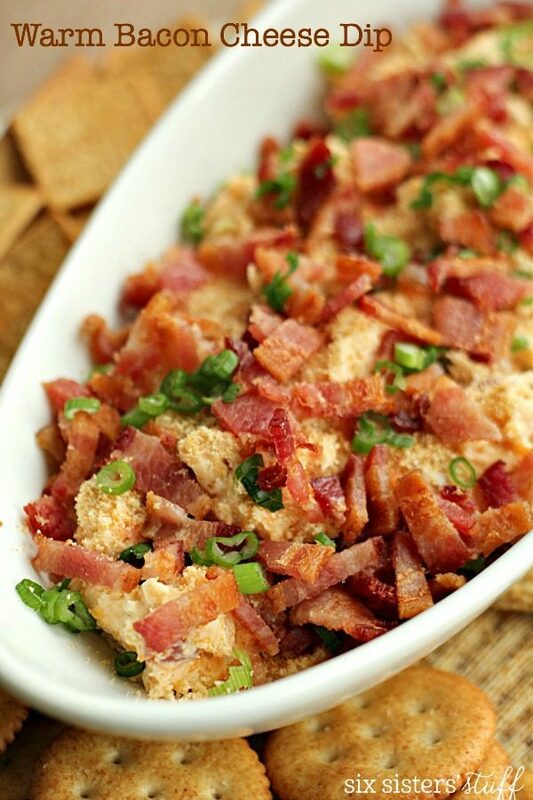 In a medium bowl, mix together crumbled bacon, cream cheese, cheddar cheese, Parmesan cheese, mayonnaise, 2 of the green onions, garlic powder, and onion powder. Spread mixture in prepared 8 x 8" pan and cook for 10 minutes, then stir. Crumble the two remaining bacon strips and top the bacon cheese mixture with the bacon crumbles and remaining green onion. Cook for 5 more minutes, then remove from oven and serve with your favorite assorted crackers. Wright brand bacon is the BEST!!! Will definitely try this recipe. Thanks! My daughter was looking over my shoulder while I was checking out this recipe, and she announced that we have to make this, and soon! Cheese & bacon are two of her favorite foods, so I know this will become a quick family favorite. Thank you for sharing! Just made this on New Years Day and everyone loved it!! Anxious to try this one. I usually take a appetizer to our pinochle card group every month and will try this. Sounds yummy !! Am I missing something? Where is the recipe?? Not sure what happened there, but we got it fixed.